The world economy has come a long way since the global financial crisis a decade ago that infected all major financial markets and set off a global recession. Unconventional monetary policy and expansionary fiscal policy helped the advanced economies to slowly get back on their feet, although the specter of deflation has only recently been vanquished. Emerging market economies survived the initial phase of the crisis in better shape, bolstered by a surge of investment-driven growth in China. Many of these economies have faltered in recent years, even as the advanced economies gradually settle into stable growth trajectories. Many countries have undertaken important reforms to financial, labor, and product markets, although these have generally fallen short of the deep-rooted structural reforms necessary to durably bolster productivity and output growth. This note evaluates the progress made by key advanced and emerging market economies since the financial crisis in several dimensions. Cross-country comparisons reveal a few surprising results that go against the grain of conventional narratives. For instance, despite a sharp fall in the unemployment rate and bullishness about American employment growth, the U.S. employment rate still remains below pre-crisis levels. Meanwhile, the employment rates of other major advanced economies have risen significantly. There are also some important disconnects between the performance of equity markets and macroeconomic variables such as GDP, both within advanced economies and between advanced and emerging market economies. While a great deal of progress has been made in repairing financial and labor markets, the limited and incomplete nature of structural reforms in many economies leaves open the possibility that financial pressures and macroeconomic stresses could be lurking under the surface. The U.S. leads the pack among major advanced economies, with real GDP now 18 percent above the pre-crisis level. Among emerging market economies, China and India have seen strong gains in real GDP, while Brazil and Russia have made little progress. When measured on a per capita or per working-age person basis, real GDP growth in the U.S. looks less impressive, while the performance of Germany and Japan looks better. 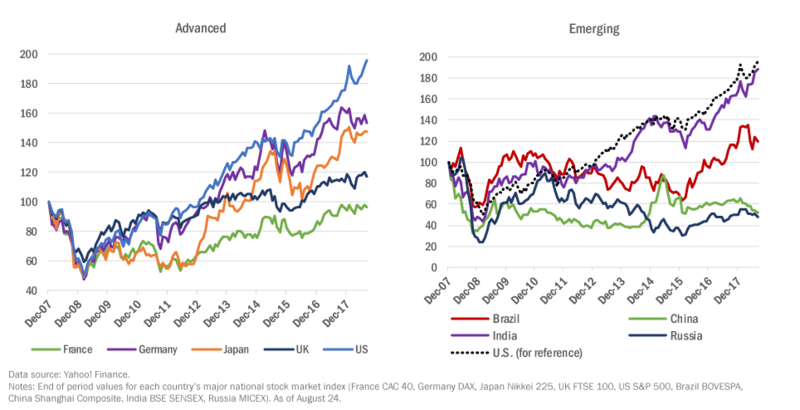 U.S. stock markets have outperformed those of other major advanced and emerging market economies over the past decade. 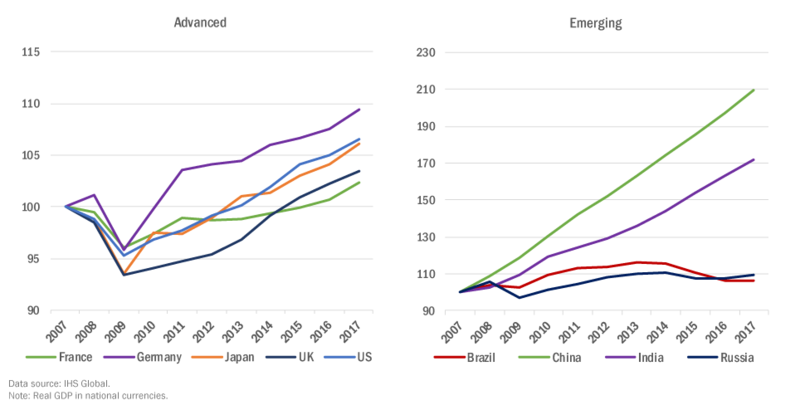 Stock markets in most other advanced economies have also risen a lot more than GDP. Equity markets have, for the most part, not taken a big hit from trade wars, political turmoil, geopolitical tensions, and other shocks that would normally generate far more volatility in these markets. Bond markets appear less sanguine; the flattening of the U.S. Treasury yield curve is a worrying portent. China and India have vastly outshone advanced economies in terms of growth. By most measures, GDP in these countries has at least doubled since 2007. In contrast, despite its economy expanding by only 18 percent over the past decade, U.S. stock markets have outperformed those of both China and India. China’s stock markets are well below their 2007 levels; stock markets of many other emerging economies have struggled as well. India’s stock market has done far better than other advanced and major emerging market economies (with the exception of the U.S. stock market), rising in value by nearly 90 percent since 2007. In dollar terms, U.S. stock market performance leaves all other countries in the dust. Notwithstanding good growth and robust stock market performance in many economies, investment and productivity growth have been lackluster, especially considering the advanced stage of the global business cycle. Over the past decade, real fixed investment has risen only modestly (by less than 10 percent) in the major advanced economies and has declined in Brazil and Russia. 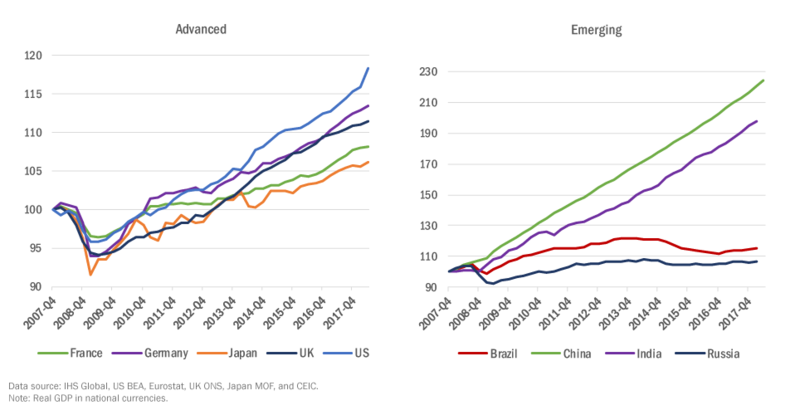 By contrast, compared to pre-crisis levels, real fixed investment is now about 2.7 times and 1.5 times higher in China and India, respectively. This recovery has been marked by low productivity growth, which in most major economies has until recently been even lower than before the crisis hit. In the U.S., the unemployment rate has fallen below 4 percent, a substantial decline from a high of 10 percent in 2009. Cumulative employment growth has, however, amounted to only about 6.6 percent relative to the pre-crisis level (13 percent relative to the trough in early 2010). Moreover, the employment rate—the ratio of total employment to the working-age population—still remains below the pre-crisis level. By contrast, the employment rate for other major advanced economies is above its pre-crisis highs, with Japan and Germany leading the pack. Real wages have grown quite modestly in most advanced economies. The risks of deflation, a concern even until recently in the Euro zone and Japan, have dissipated. Core CPI inflation appears to be converging to a range of 1-2 percent among advanced economies and, at a higher level, headline CPI inflation is converging among emerging market economies.